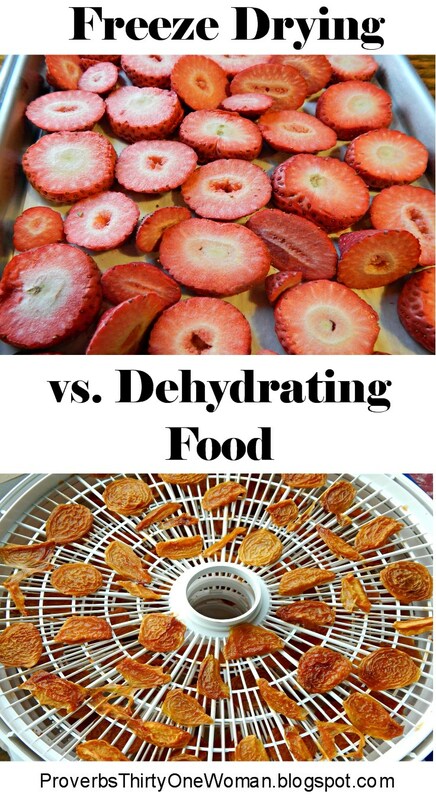 At first blush, freeze-dried food and dehydrated food - or using a freeze dryer vs. using a dehydrator to preserve food - may seem the same. 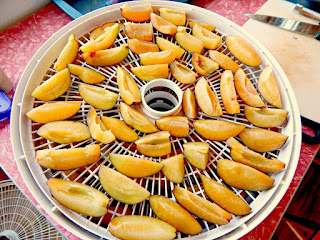 So why would I buy a home freeze dryer when I already have not just one, but two dehydrators on our homestead? Both methods of food preservation remove moisture from food, which then may be re-hydrated with ordinary water. I've even heard some people say that one method is just as good as the other. But there are several important differences between freeze driers and dehydrators. Dehydrating is an ancient practice. During biblical times, people made their food last longer by drying it in the sun. The Romans dried vegetables and fruit in “still houses,” which sped the process through fire. 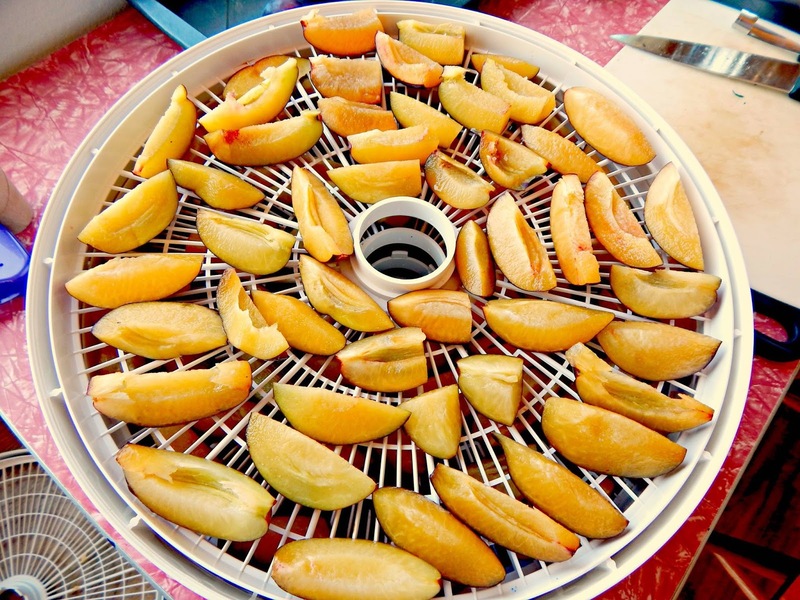 Today, most dehydrated food is made in an electric dehydrator, but the process is essentially the same: hot, dry air hits the food, removing much of its natural liquid, but not fully cooking it. * Home dehydration removes about 80% (some sources say only 70%) of the liquid in food. ...and how they came out of the dehydrator. * Dehydrated food is shriveled and chewy. Once rehydrated (a process that's optional), the food is still quite different from fresh. * With a few minor exceptions, only fruits and vegetables can be safely dehydrated. Low-fat meats may also be dehydrated, but without added preservatives, must be kept frozen. 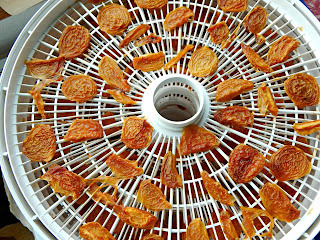 * Home food dehydrators come at many price points, but the least expensive (yet still quality enough to do the job - click here for tips on choosing a good dehydrator) costs about $75. Freeze drying is a relatively modern technique, first reliably used during World War II to preserve medicine and blood plasma. Food is placed in a vacuum chamber, where the temperature is lowered to below freezing. Once the food reaches -40 degrees F., the machine raises the temperature until the ice (formerly liquid in the food) goes from a solid state to a gaseous state. (This is called "sublimation.") Finally, the machine removes the vaporized ice from the vacuum chamber. This process keeps the structure of the food intact. Despite what some internet sources claim, you cannot freeze dry food without a freeze drying machine. 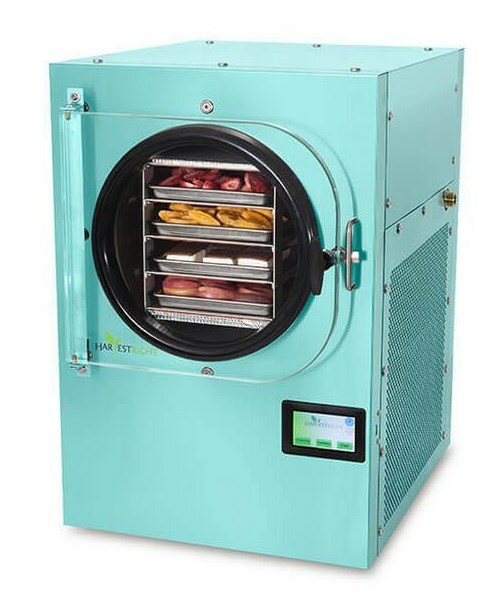 * Home and commercial freeze drying removes 98 - 99% of the food's moisture. * Freeze dried food retains about 97% of its nutritional value. * Properly freeze dried food is not shriveled; it closely resembles fresh food. Strawberries fresh out of my home freeze dryer. * Vegetables, fruit, meat, and some dairy can be freeze-dried. Only very fatty foods (like butter) do not freeze-dry well. Some surprising foods that can be freeze-dried include milk, cheese, and ice cream. * Freeze dried food lasts 20 - 30 years. 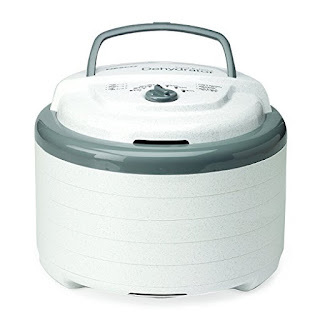 * Only one manufacturer sells freeze dryers made for home use; a small unit costs just under $2,000. 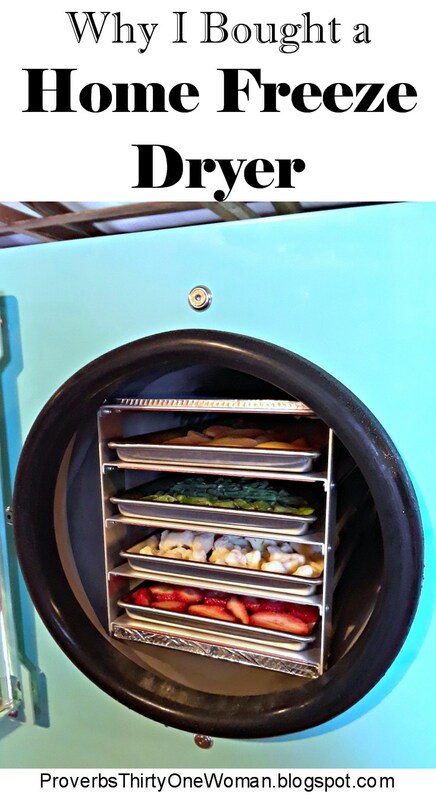 To learn more about why I purchased a home freeze dryer for my family, click here. Click here to learn more about home freeze dryers in general. Well, I did it. I pushed the button on a home freeze dryer. I can hardly believe it - but I feel great about the decision! Yes, it's a little bit of an investment, but I have some specific reasons for adding the machine to our homestead. 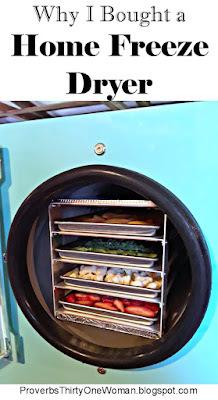 Why a Home Freeze Dryer? 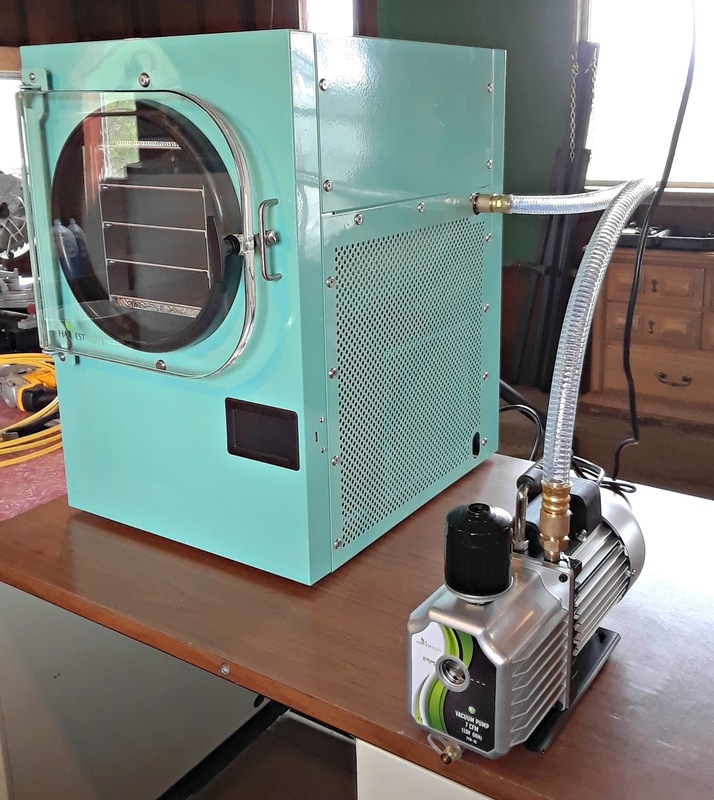 One of the most common reasons consumers are willing to spend a chunk of cash on a home freeze dryer is that they believe the federal government when it says every citizen should keep at least 3 weeks of food in storage, in case of emergencies. Yes, you can do this with store bought canned food, home canned food, home dehydrated food, or store bought freeze-dried food. But home freeze drying has distinct advantages. * Freeze dried food takes up very little space. The same amount of food that would require a large shelving unit if you used home canning jars, or an entire freezer if the food was frozen, fits in a small box if freeze-dried. * You don't have to worry about freeze-dried food going past an expiration date. It's good for at least 20 - 25 years - and since most of us rotate the food in our pantry, we can feel assured the food isn't going to go bad on us. * Freeze dried food is less susceptible to damage during an emergency. In an earthquake, canning jars break. During a power outage, food in a freezer goes bad. Flooding ruins dehydrated food. But freeze-dried food in sealed bags is unlikely to suffer much. * Freeze drying retains more of the food's nutritional value than any other long-term preservation method - 95% of its nutrients remain intact. Dehydrating and canning can't boast that. What the medium-size freeze dryer looks like set up on our homestead. However, store bought freeze dried food is expensive! Cheap 1-serving meal packets are at least $5 each, and more decent-tasting single servings are upwards of $9-10 each. I've never been one to buy freeze dried food. I'm too frugal, and I always figured a combination of my home canned and homegrown food served my family well. However, when I discovered I was diabetic and could reverse my blood sugar to normal by eating a keto diet, I had to question my former rationale. If for some reason I couldn't get food at the grocery store, what would I do? At first I thought: I'll just get sick...and if the situation lasts long enough, I'll die. I was okay with that...Then I considered what a burden this would be on my family. So what could I do to store a little keto food for emergencies? I could dehydrate a few things. 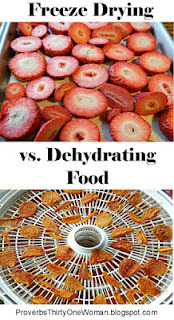 For example, I could home dehydrate jerky, low carb fruits, and low carb veggies. But homemade jerky without preservatives doesn't last long unless it's frozen...and frozen food is only good for maybe a year. And what if the power goes out and we lose all the food stored in the freezer? In addition, home dehydrated fruits and veggies only last a year or two. Plus, I'm personally not a big fan of dehydrated vegetables. Our first batch came out wonderfully! I could buy freeze dried food, even though it's expensive. But trying to find keto-friendly options? Ugh! Pretty much impossible. And yes, I'd still have my garden (barring a fire or flood or some other devastating problem) and in the future, we hope to have more animals that feed us. But what if it's a bad growing year? Or something destroys the crops? Or animals aren't producing the way we'd hoped? This kind of thing happens more often than most of us want to admit. For me, the answer was purchasing a home freeze dryer. (Incidentally, only one company sells home-use freeze dryers: Harvest Right.) In it, I can preserve any vegetable, any meat, and many dairy products. In other words, I can create keto-friendly meals and foods in an easy to store package that's less susceptible to disasters. A win! Our freeze dried green beans. 1. 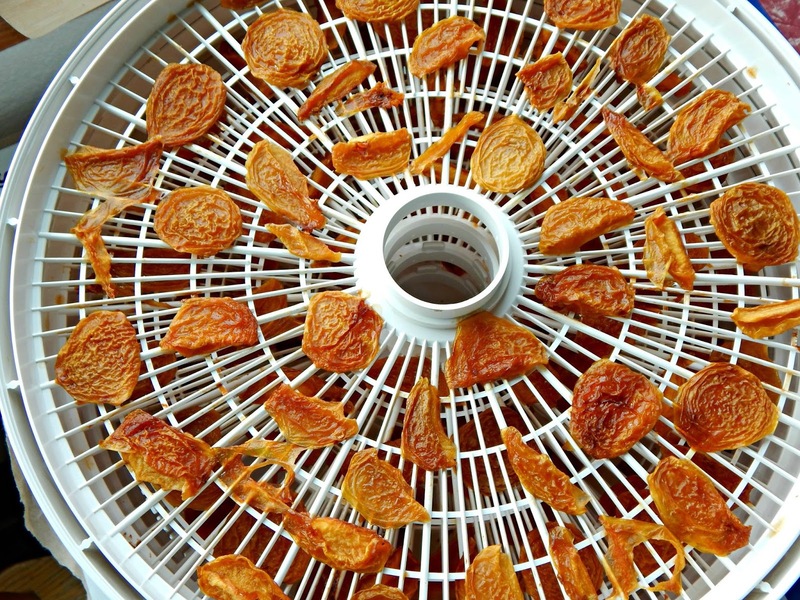 Freeze drying is a lot less work than canning. I love canning; I really do! But it's a lot of work to prep the food, heat it, put it in jars, monitor the canner, remove it from the canner, and get another batch going. With freeze-drying, you pop prepped food into the machine, check it once or twice, and then remove the food and seal it in a jar or bag. With canning, you have to be present through the entire process...and it can be exhausting. With freeze-drying, you can do other things while the machine is doing the work. 2. With my various health issues, I'm finding I'm way more fatigued than I wish I was. What if the fruit from our orchard is on, and I just don't have the energy to can it? Even without much energy, I can pop some fruit in the freeze dryer. I might even coach my kids to do the work - whereas there's no way they can safely can. 3. I love that freeze-dried food takes up so little storage space! I already mentioned this, but it's a big deal when you live in a small house like ours. I plan to put my home freeze-dried food into mylar bags with oxygen absorbers, then put those bags in plastic storage tubs to prevent the food from being crushed. 5. Freeze drying prevents food waste. It's true we don't often have leftovers around here. (Seriously, my kids need to get jobs to pay for the enormous amounts of food they eat! Ha!) But when I do have leftovers, I can pop them in the freeze dryer and know they won't spoil. 6. Freeze drying will be the bomb for medicinal herbs. Since freeze drying retains almost all the nutrients and properties of fresh food, I think it will be an outstanding choice for perserving the medicinal qualities of herbs. Once our freeze dryer arrived and we set it up, I threw in a batch as soon as possible, wanting to immediately test the machine for any issues that might arise. On the off chance that the food didn't "turn out," I chose mostly pre-frozen food, which is cheap and already prepped. My first batch contained frozen green beans, frozen cauliflower, fresh strawberry slices, and (for my hubby) frozen peach slices. We were delighted with the end results! First, we tried everything without rehydrating it. The green beans and cauliflower were very good. (I think they'd be amazing properly seasoned and eaten without rehydrating - a tasty, healthy, crunchy snack!) And the peaches and (especially) the strawberries got gobbled up the same day. We also rehydrated a portion of each food. Everything tasted fresh once we allow it to absorb some water. Amazing! I'm excited about the possibilities here, so as I learn the freeze-drying ropes, I intend to keep you up to date on my difficulties and successes. Keep an eye out for more freeze drying posts! Learn more about Harvest Right freeze dryers here.